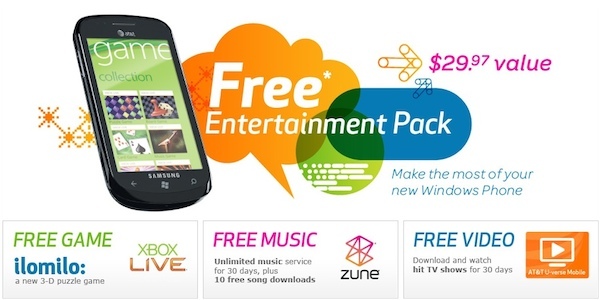 Pre-order a WP7 phone through AT&T, and you’ll pick up a month of Zune-Pass for free (as well as the game ilomilo). That’s $15 of unlimited streaming music, that they hope you’ll get hooked on, and keep buying. Of course, this is overshadowed by the fact that if you pre-order from Microsoft directly, they’ll hook you up with a three-month free pass, which is a much better deal. Better yet is Austrian carrier A1, who are giving a free 4GB XBox 360 to everyone who picks up an HTC Trophy. Free 360s? Dang, why can’t they do that on this side of the pond? It’s a great way to push the XBox Live integration. You actually don’t need to pre-order it from att. As long as you buy it from them you get the pack. I’m waiting on the email from Microsoft to see if their pre-order program comes with att branded phones. Because, if it does you may be able to get the 3 months of Zune from Microsoft plus the game and the 30-day U-verse trial from att. Just a hypothesis, but hopefully I’ll know by next week. Do you happen to know if ilomilo is part of this promotion or does it come on all AT&T WP7 phones? From what I’ve read/heard, it’s part of the promotion. The game is ATT-only for the remainder of this year which corresponds to the promotion deadline which is December 31, so as long as you have an ATT WinPho7 phone, you’ll get the game for free. Next year ilomilo will no longer be an ATT exclusive, so I don’t know if they’ll be giving it for free anymore. I don’t think the game comes pre-installed because none of the review vids that I’ve seen have had ilomilo on the phone.